Representing decades of service in almost every type of volunteer role for Dartmouth College that exists—alumni class, club, and group leadership, enrollment interviewing, reunion planning, Alumni Council and Association of Alumni leadership, Dartmouth Outing Club leadership, fundraising, and other service—eleven alumni have been chosen by the Alumni Council to receive 2009–10 Dartmouth Alumni Awards and Dartmouth Young Alumni Distinguished Service Awards. The council's Alumni Awards Committee, chaired by Mark Harty '73, chose nine alumni to receive the Dartmouth Alumni Award. 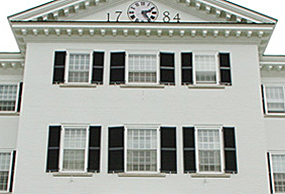 The qualifications for the award, established in 1954, are long-standing and meritorious service to Dartmouth, career achievement, and other community service. Alumni are eligible after their 25th class reunion. The council's Young Alumni Awards Committee, chaired by Tracey Salmon-Smith '87, chose two alumni to receive the Dartmouth Young Alumni Distinguished Service Award. The qualifications for the award, established in 1990, are breadth, depth, and length of volunteer involvement. Alumni are eligible in the first 15 years after graduation. Putnam Blodgett '53, '61Tu – Put will receive his award at the Dartmouth Outing Club's 100th anniversary banquet in December. John Ballard '55, '56Th – John will receive his award at the Class of 1955 Reunion in June 2010. Dudley Smith '60 – Dudley will receive his award at the Class of 1960 Reunion in June 2010. Robert Barr '73 – Robert will receive his award at Class Officers Weekend in September. Matt Dwyer '75 – Matt will receive his award at the Alumni Council meeting in December. Martha Johnson Beattie '76 – Martha will receive her award at the Alumni Council meeting in May 2010. Merle Adelman '80 – Merle will receive her award at the Class of 1980 Reunion in June 2010. Mark Alperin '80 – Mark will receive his award at the Class of 1980 Reunion in June 2010. Rick Silverman '81 – Rick will receive his award at the Alumni Council meeting in May 2010. Jennifer Tudder Walus '97 – Jennifer will receive her award at Club and Affiliated Group Officers Weekend in February 2010. Belinda Chiu '98 – Belinda will receive her award at the Alumni Council meeting in December.